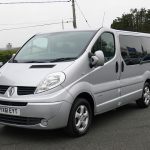 If you need a wheelchair accessible vehicle that has excellent all round visibility and can accommodate up to six passengers including the wheelchair user, then this is a good choice. 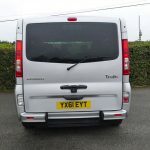 The deep privacy windows in the rear and wide side sliding doors give this WAV an airy feel – an excellent vehicle to get a wheelchair user out and about and enjoy the scenery. 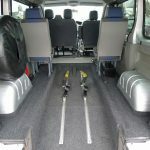 The converters have also installed floor tracking allowing the wheelchair user to be moved forwards or backwards into a position that is their preference. 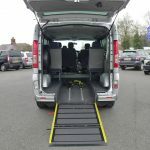 The ramp at the back is two piece making the incline up into the vehicle less of a gradient and, of course, the surface is finished with a non-slip floor. 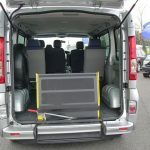 Once the wheelchair user is on board and the preferred location established, the four point wheelchair restraint system ensures that the wheelchair is firmly fastened in place (please see the demonstration video we have provided under the ‘Advice’ tab above on a similar vehicle). 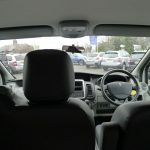 Once the safety belt has been engaged you can then rest assured that the wheelchair user is nice and safe in the vehicle ready to set of on their journey. 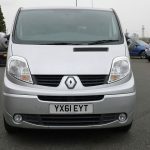 If the weather is cold then the Webasto heater in this WAV will ensure that all passengers are kept nice and warm when out and about, and should we have Summer similar to that of 2018, then the air conditioning will keep all occupants nice and cool. 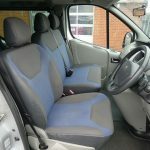 We hope you agree that this wheelchair accessible vehicle has a lot to offer. 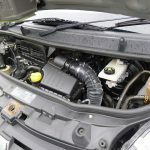 The 2 litre diesel engine with automatic gearbox combines both economy and efficiency in this vehicle as well as making it an easy vehicle to drive. A full list of features can be found in the specification section included on this webpage. 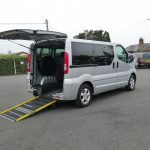 If you would like to know more about this wheelchair accessible vehicle, please give us a call and we are here to help ensure that you find the right vehicle to suit the needs of the wheelchair user.